The Empty Stocking Fund benefits three cooperating agencies, Bradfield Community Center, Mizpah Community Center and the Salvation Army. Money can be donated by sending it to The Lima News, 3515 Elida Road, Lima, OH 45807, or by dropping it off at any Superior Credit Union branch. 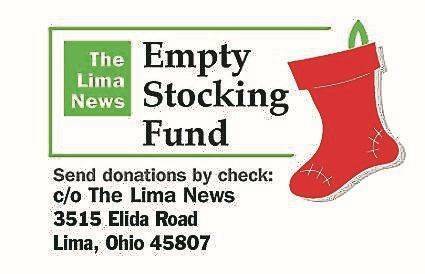 Donations of toys and nonperishable food items will be accepted at The Lima News office. These stories use assumed names to protect the participants’ privacy. See past stories at LimaOhio.com/tag/emptystocking. LIMA — For Mark, Lima has become a refuge for him and his two sons. Mark and his sons, Cory, 9, and Tom, 8, made the move to Lima nearly a year ago, escaping an out-of-control drug culture in their former hometown. Lima has been a much better fit for his family, Mark said. Unable to work and currently on disability, Mark is now raising his sons on his own after their mother was denied custody after an incident that Mark said left Tom in an induced coma with hemorrhaging in his brain. Complicating matters is the fact that Cory has been diagnosed with Bipolar Disorder and Attention Deficit Hyperactivity Disorder (ADHD) and is also on the autism spectrum. Tom was also diagnosed with ADHD and dyslexia. Being on a fixed income puts a strain on Mark when it comes to being able to provide for his sons’ needs, including clothing. Both of them need youth size 2 boots for the winter. The family has received some donations of clothes in the past, but they often do not fit. Both boys wear size 7 or 8 clothes, Mark said, in both shirts and pants. Both boys enjoy Nerf guns, as well. Tom also said he would like a train set for Christmas, while Cory would like a toy crane.